All ABOUT 3wm— The Three Wise Monkeys: somehow you get it; have heard it; maybe even experienced it. Why are we using it? It goes back to the beginning of this publishing project originally called DDD. DDD is local speak for the jobs and lifestyles that young Koreans (and not so young and not just Korean) want no part of: Difficult Dirty Dangerous. It’s a maxim that signifies being uneducated, underemployed and dare to say it even unfashionable. It was also the title of a bilingual and open submission magazine started in Daejeon, South Korea around the time of the 2002 World Cup which was hosted in different cities here on the peninsula. The east meets west magazine was a thoughtful squeezebox of cutting edge featuring first person stories about being inside a boy’s prison, getting caught up in a cult and exploring the Falun Gong movement here. It also carried poetry and sculpture spreads, student essays, political and NGO profiles… even being at punk rock gigs and experiencing dog cafes and fat farms were in the mix. 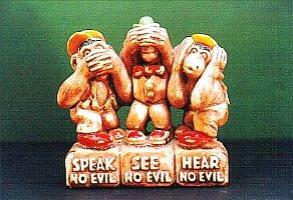 It’s now the 21st century and the Three Wise Monkeys are amongst us like never before. See no evil, hear no evil, speak no evil: a Buddhist maxim warning not to invite immorality into your mind. The logic threads that if humans are not exposed to evil then evil will not take hold of us. A nice day-by-day groove that lets us breathe in and breathe out calmly and also carry a very profound understanding: yes, the world is imperfect so don’t let your passions get stirred up too easily. 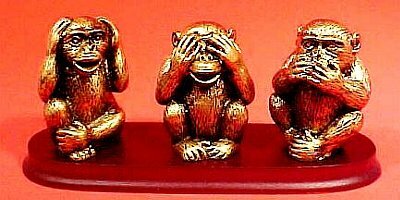 In our international and all-knowing times the Three Wise Monkeys is still a maxim and a universal image that also offers fellow travelers a different warning: not to let your passions get too caught up only in yourself to the point you can’t see what’s really happening around you. To connect it all together: The Three Wise Monkeys is a modern-way reincarnation of DDD magazine– A lot of good DDD stuff can be mined from its archive on this site. We are a weekly updated blogazine with inside-out reportage, interviews, images, videos and everything else we can frame into it that is provocative, smart, entertaining and takes on life here from the Korean Peninsula. B.T.W. -Don’t worry too much whether you are an organ grinder or just another monkey. You can be the Third Wise Monkey: blog at us, subscribe to us and contribute with us.